As a mom to twin toddlers, I can not be organized enough! I vividly remember when my boys were a week old, I was exhausted and overwhelmed, and my mom came to visit. She helped me to get organized by creating a diaper changing station, a feeding station, and making sense of all the baby clothes and gear that I had. Immediately I felt more in control and ready to tackle whatever came my way. Now that my boys are older and active, having an organized home is essential for our happiness as a family. That's why I was so excited when I discovered Thirty One gifts. 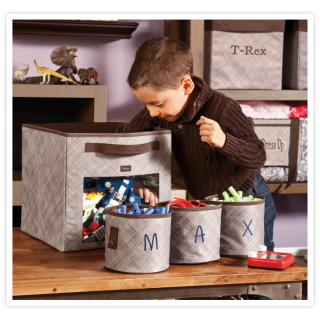 I am now very pleased to announce that I am an Independent Consultant with Thirty One and I can share all my organizing and storage tricks with you! Thirty One has an amazing catalog of handbags, totes, and storage solutions that are perfect for busy moms and families like mine. I use the products myself, and would not recommend them if I didn't love them. The opinions and ideas I will share on this blog are my own, however I do receive a commission on sales through my Thirty One website (see my Disclosure Policy for details). If you're new to Thirty One, or a fan looking for a new consultant, I invite you to visit my website at mythirtyone.com/Laura-R (affiliate link). You can also contact me with questions or for more information. I'll also keep a current list of specials and offers here - be sure to bookmark this page!